Discussion in 'Ridiculous streetbikes with 6 CPUs and too much HP' started by Peanuts, Dec 6, 2014. I ordered a Wings exhaust and heat shields. 2wxplorr and SunshineTom like this. I moved it out of the way so I could get the Christmas tree in the house and then daydreamed about riding it as I put up the house lights. The other day I did give it (1190) some new LED lights though! Rode it. Rode it some more. Talked to the dealer about 10k mile service and scheduled a quick check and computer flash since the oil is fresh and the air filter will be taken care of later this week. By next weekend, I'll have real farckles to report! Rode it (1190r), loved it, got cooked by it! 34k km's by now - still no problems! I sort of dry washed it. I had no time to wash it properly so I just cleaned the most part of the dirt caused by riding it in the rain in the city. I also tweaked a bit the position and focus of my Clearwater Darla LED lights. also mounted 4 ram balls one on mirror , one low on crash bars , one on rear rack , and the final one middle of handlebars. this should allow me to shoot some great footage from my video camera. ....well I ordered a Madstad. This isn't exactly today, but I put down a deposit last Friday and will pick up my 2014 non R on Saturday!!!!' Need to do the cyclops front light and airbox quickly. Then the grey wolf should be good to go for a while. Btw: starting with crash guards, heated seats and grips plus touratech panniers. Moving up from 2013 triumph street triple R. Very excited. Demo ride was amazing. Air box has been fitted with Unifilter from new (as per KTM Australia recommendation) and was spotless when opened up. davyjones and morotjos like this. Did you also go with the wide ban o2 sensors from Rotti for the Auto Tune? Yep. They come with the auto tune kit so the bungs get welded in before the ceramic coating gets done. 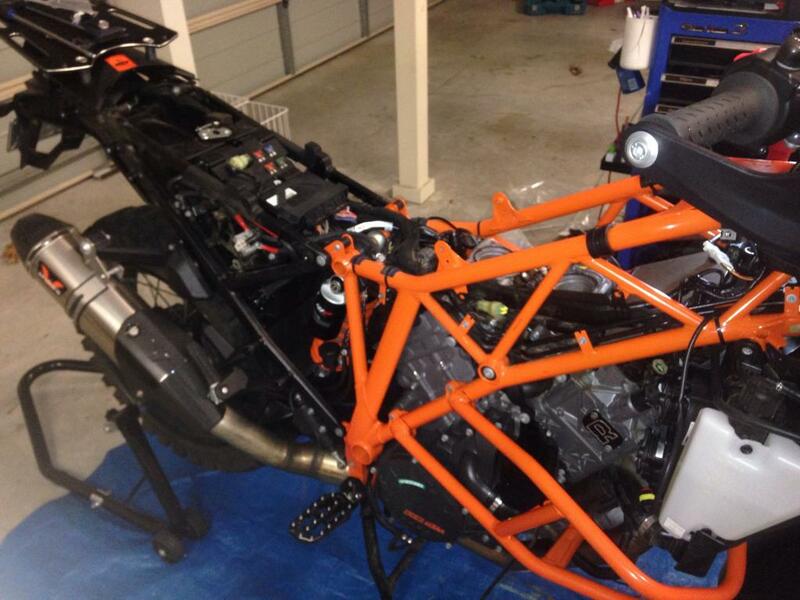 Whats the KTM bulletin about the side stand spring? Mine's a 2013 model. I got the dealer to run a check on all service bulletins for my bike and the only thing that came back (that hadn't been done) was a replacement part for the side stand, I think it's a spring - might need to check what's in the bag! It should be a new mount for the side stand leg plus a shorter spring. OK, so this is what's in the kit. 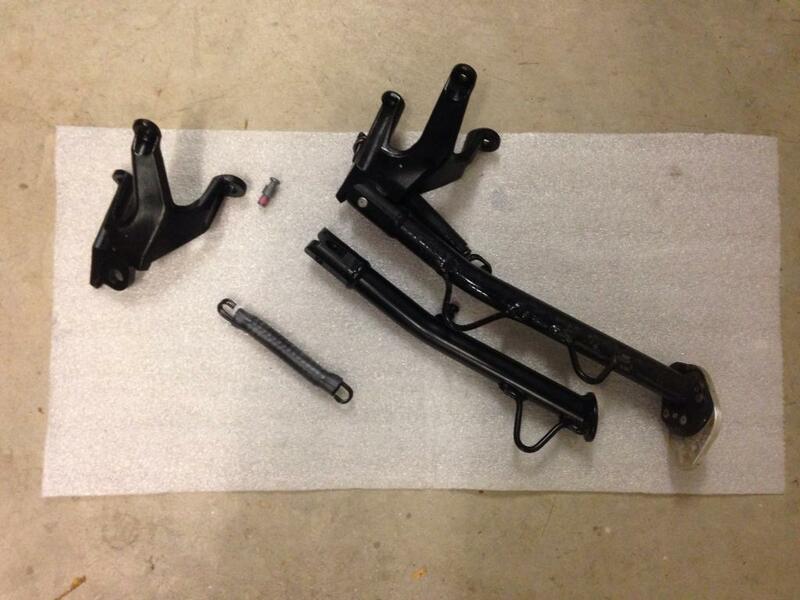 A bracket, spring, spring bolt and a new side stand leg which is a LOT shorter than the current one. Probably 2" shorter. I'm worried that this leg is for a standard 1190 not the 1190R. Looks wrong. I'd just swop the long leg onto the new mount with the new spring. That's pretty much what the dealer said - fit the new bracket and spring to your stand - so I wasn't expecting the stand leg to be in the pack at all.